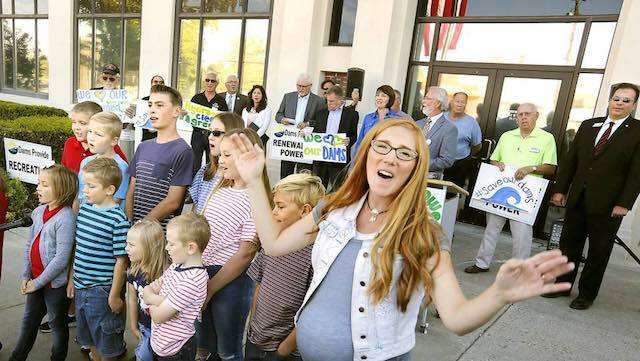 KENNEWICK, WASH. -- A plan to spend $750,000 of state taxpayer money to study the impacts of tearing down four dams on the lower Snake River is not sitting well with Tri-Cities area supporters of the dams. Improving orca habitat is a topic of discussion across the State of Washington. It is safe to say that all Washingtonians care about the health and future of the unique and iconic Southern Resident whale population. No one disagrees that this group of orcas is in trouble. The Tri-Cities has always strongly supported robust salmon recovery efforts, including improvements to hydro, habitat, harvest and hatchery programs, all of which also benefit orcas. We support many of the elements outlined in the Southern Resident Orca Task Force report and recommendations dated November 16, 2018. We ae very concerned with your funding request for the Southern Resident Orca Task Force to study potential breaching or removal the four lower Snake River dams. Your budget priorities include a $750,000 proposal to fund a stakeholder process on the associated economic and social impacts as well as mitigation costs of Snake River dam removal. The task force would essentially be duplicating the same information-gathering effort that is already several years underway by the federal agencies in the Columbia River Systems Operations Environmental Impact Statement (CRSO EIS). The CRSO EIS is a regional, comprehensive effort to evaluate a range of operations alternatives for the 14 federal hydropower facilities that exist along the Columbia and Snake Rivers. The EIS process has multiple opportunities for public engagement. All Northwest states and tribes are already cooperating in this EIS process, which includes an evaluation of the four lower Snake River dams, along with an economic impact analysis and stakeholder input. A state-level effort would not be as comprehensive as the current federal effort, would not comport with the National Environmental Policy Act (NEPA), and thus would not result in a product that can be relied upon by decision-makers or inform the CRSO EIS process or other science-based species recovery activities in the Northwest. Given the relative size and limited scope of such an effort as compared to the CRSO EIS process, it is reasonable to question whether the recommendations generated by such an effort would result in real help for the orcas. Simply put, this study would not be the best use of limited taxpayer resources. Additionally, National Oceanic and Atmospheric Administration (NOAA) Fisheries - the agency with the expertise and responsibility for the recovery of these pods - has increased efforts to inform the region about fish, orcas, and dams. NOAA has released three fact sheets recently (one in 2016 and two in 2018) specifically on the four lower Snake River dams and the orcas. They assessed the operation of the four lower Snake River dams and their effects on listed salmon and steelhead in the 2008 Biological Opinion. In 2014, their supplemental Biological Opinion re-examined the issues, including consequences for Southern Resident killer whales. Neither opinion concluded that breaching the dams is necessary for recovery of the Snake River salmon or Southern Resident killer whales. The biological opinions concluded that hatchery production of salmon and steelhead in the Columbia and Snake River systems more than offsets any losses of salmon from the killer whale prey base caused by the dams. However, after decades of using other arguments in their attempts to justify removing the four lower Snake River dams, some environmental groups have latched-on to the plight of the orcas. They are now stating that removing the four lower Snake River dams is the solution to improving the orcas' diminished Chinook salmon supply. Despite the availability of accurate information from NOAA and other reputable sources, these groups are using the orcas to play on the public's sympathies and promote their real goal: removal of the four lower Snake River dams. Fish from the Snake and Columbia Rivers are just one part of the list of Chinook runs which are important for orcas in Puget Sound. These orcas consume many different salmon stocks, including Fraser River Chinook, Puget Sound Chinook, and Coho salmon. In winter, the whales consume Chinook from many different stocks up and down the coast, including but not limited to fish from the Columbia and Snake Rivers. While increasing overall salmon abundance is likely to help the whales, it is important to understand that NOAA Fisheries has concluded that because orcas feed on many different stocks at different times, one narrow approach to fish recovery, such as breaching dams on the Snake River, will not make a measurable improvement for orca survival. It is instructive to note that in his May 2017 ruling, U.S. District Judge Michael Simon accepted NOAA Fisheries' conclusion that hatchery production of salmon and steelhead in the Columbia and Snake River systems is more than sufficient to offset any reduction in salmon abundance caused by federal hydropower dams. Judge Simon did not rule in favor of plaintiffs on this issue, who had argued that hydro system operations endanger orcas. While prey is important to long term orca recovery, to help orcas in the immediate term we should focus on the more logical and much quicker solutions including further restrictions on boat traffic and noise in Puget Sound, reducing and preventing urban pollution contaminating the Puget Sound, and increasing and expanding current habitat restoration efforts on the Snohomish and Skagit rivers and in other rivers contributing directly to the Puget Sound where salmon spawn. In addition, all ways to improve salmon populations should be explored and implemented; e.g. further restrictions on commercial salmon harvest and greater control of natural marine predators occupying unnatural positions around built structures. The latest research concludes that booming populations of sea lions, harbor seals and West Coast marine predators are eating more Chinook salmon than ever, competing directly with orcas for this food supply. In short, the most immediate way to improve salmon numbers is to stop killing them ourselves. Investments in salmon restoration have included a complete overhaul of the federal dams to make them more fish friendly, at a cost of more than $2 billion. For example, every one of the federal dams on the Columbia and Snake Rivers have been retrofitted with state of the art downstream fish passage technologies. These "fish slides" and other technologies are helping young fish migrate safely and swiftly with per-dam survival rates averaging 96% past the four lower Snake River dams. Due to the success of improved passage and dam operations, NOAA Fisheries and other scientists have stated that these survival levels are similar to those seen in undammed rivers such as the Fraser River in British Columbia. The Northwest is home to the largest fish and wildlife restoration program anywhere in the nation, and likely the world. Nearly $17 billion has been spent to mitigate for the impacts of the dams on fish and wildlife since the late 1970's. It is important to point out that the Northwest is unique in this respect too: almost all these costs are borne by Northwest families and businesses through their electric bills -- not U.S. taxpayers. While the federal hydro system provides 60% of the Pacific Northwest's clean power, it does much more. The system of federal dams protects rural communities and big cities alike from devastating floods, creates a river highway that links the Northwest to the rest of the nation, and provides recreational opportunities and irrigation for over 7 million acres of farmland producing $8 billion in agricultural income. Barging on the inland Columbia Snake River System moves, on average, approximately 9 million tons of cargo valued at over $3 billion each year. In fact, most years see nearly 10% of the nation's wheat exports travel through our lower Snake River dams. There is no question that the federal hydro system is the backbone of the region's carbon free energy supply and the lifeblood of its economy. Because of their location, size and ability to help meet peak power loads, the four lower Snake River dams do much more than generate electricity -- they are key to keeping the system reliable and help support wind energy. These dams lie east of the other federal generators, so they provide a significant contribution to transmission grid reliability. BPA markets power from 31 federal dams, but only the 10 largest of these dams keep the federal power system operating smoothly through the use of automatic generation control, AGC. Those 10 dams include the four lower Snake River dams. When total electricity being consumed differs from the generation in the power system, automatic signals go to these few dams with AGC to instantly increase or decrease generation. This maintains the constant balance of generation and loads, or electrical demand, which is necessary for power system reliability, critical to keeping the lights on, every minute, every day. We believe that your carbon reduction goals are in conflict with dam removal. The four lower Snake River dams are strategic clean energy assets and maintaining them is an important component of a clean energy future. We will be working with the legislature to request removal of the $750,000 proposal to fund the study. It is a duplicate effort of federal agencies, and should not lie on the backs of Washington taxpayers.